Showcase a few different crops on your patio using this Panacea Two-Tier Vintage Grow Bag Patio Planter and Stand. This foldable, square steel frame expands, and creates two triangular planting areas. Included, burlap bags attach to the frame, filling the openings in moments for a wealth of planting room. Velcro strips keep these two bags securely in place, while a lined interior and drainage holes help your plants remain healthy. The square steel of the frame enhances its angular look, and the brown, powder coated finish furthers the rustic hint. 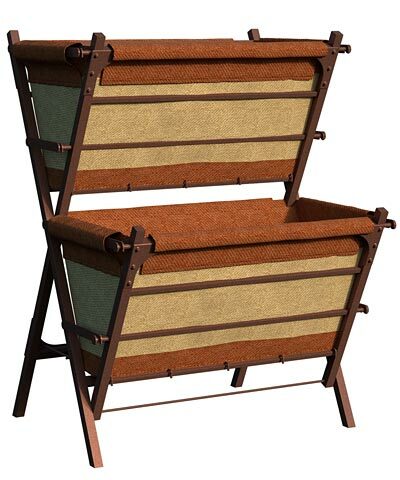 Additional brown tones on each burlap liner contrast your plants, and the frame folds for seasonal storage. Increase the planting area on your deck with this Two-Tier Vintage Grow Bag Patio Planter and Stand. Some assembly required.